On the Settings tab of Contact Form plugin by Supsystic you have the ability to configure your plugin settings. Send usage statistics – send information about what plugin options you prefer to use. Enable blocking Contact from same IP – you can enable this feature to block form submission from same IP more then one time per hour – to avoid spam. Disable autosave on Form Edit – by default Contact Form plugin makes autosave all your changes that you do in Form edit screen, but you can disable this feature here. Just don’t forget to save your Form each time you make any changes in it. Enable promo link – if you check this option – the small promotion link will be added in the bottom of your Form. User role can use plugin – users with these WordPress roles will have access to whole plugin from admin area. Administrator is chosen by default. Disable HTML Emails content type – some servers fail to send emails with HTML content type: content-type = “text/html”, so if you have problems with sending emails from Contact Form plugin – try to disable this feature. WordPress PHP Mail – this engine will be used by default. SMTP Hostname – e.g. smtp.mydomain.com. SMTP Login	– your email login. SMTP Password – your email password. SMTP Port – port of your SMTP provider. 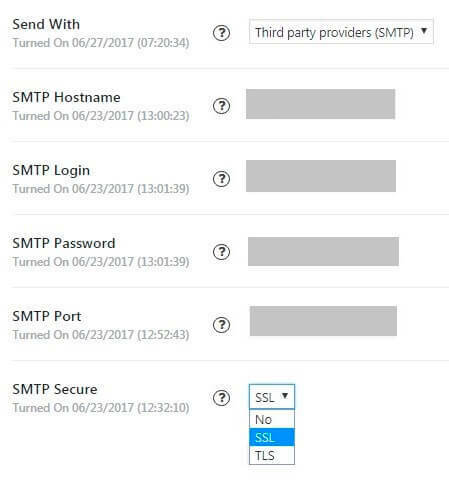 SMTP Secure – Use secure SMTP connection. If you enable this option – make sure that your server support such secure connections. Sendmail Path – you can check it on your server, or ask your hosting provider.